With boston.com, I know what I’m getting and when it was published without having to decipher much. Boston.com’s page is obviously about the photos. A small amount of text at the top to provide viewer context doesn’t distract from the goal of the site. The layout also wins because I don’t have to click to get through the gallery, simply scroll down. Chicagotribune.com’s page is obviously about the ads. Sure, the photo is in the middle, but it’s barely bigger than the largest ad on the page and total ad area dominates the real content. What are you trying to showcase here? Boston.com wins again. I am here to see photos, don’t make me squint! This is where the Boston Globe really shines. I don’t know how they obtain all the quality photos they publish, but they are constantly impressive. Chicago Tribune, on the other hand, looks like they picked the best photos from a high school point-and-shoot photo project. This entry was posted in Photo on January 20, 2009 by benburleson. On the radio this morning, NPR had a Morning Edition story on the debate between contenders for the GOP Chairman position. The story was full of quotes highlighting the sad state of the Republican Party. But the most appalling was a quote exclaiming, “the Republican Party will be ready for battle in 2010!” against the Democratic Party. They really don’t get it. America is in trouble and they’re still trying to divide us. The reason Obama won is because he is a shining star guiding and uniting all Americans. The last thing we need is a group of politicians coming back attempting to divide the nation. Wake up GOP! You need more than new leaders, you need a new agenda! This entry was posted in Politics on January 6, 2009 by benburleson. I don’t know why, but I love the tilt-shift effect. The site tiltshiftmaker.com allows geeks like me to make tilt-shift photos without knowing anything about them! I grabbed this photo from a Google image search. This entry was posted in Photo on January 6, 2009 by benburleson. So, I came up with a technique to scramble the image and rearrange it using CSS so it looks normal. Go ahead, try to steal the image! It could use a lot of cleaning up and there are plenty of possibilities for improvement. I’m hoping the Open Source Community will pick it up! This entry was posted in Photo, Programming on December 24, 2008 by benburleson. OK, here is the second part of my approach to (safely) apply software application updates remotely to a Blackfin device without using netboot. See Part 1 for the background. The mounted directory /mnt/flash/ is used to store application updates. Those will persist between device power cycles and are deployed each time the device boots. echo "md5 BAD! Deploy aborted." echo "md5 OK. Deploying applications." This script changes to the directory /mnt/flash/ (our persistant flash filesystem) and checks if a valid tarball exists for this device. The tarball must begin with the hostname of the device and includes a version id. The tarball must also pass an md5 check. If the check is successful, the tarball is exploded from / (root), placing new software in the device. echo "Usage $0 <version>  e.g. $0 1.0.2"
echo "$pkgname already exists. Download new copy? [Y/n]"
echo "Using local copy of $pkgname." echo "Downloading new copy of $pkgname." echo "$pkgname needs to be downloaded." This script is just a smart downloader. It takes an input parameter as the version number of the device application upgrade to download. It prepends the hostname to the version number and creates two filenames: 1) the tarball, and 2) the md5. After the download of the upgrade, it performs an md5 check and deploys the new upgrade. LCO_VER_FW is just a variable conatining the hostname and version id. And there you have it! A complete, safe solution to upgrade device-specific software remotely without using netboot! This entry was posted in Programming on December 23, 2008 by benburleson. Holy Crap, how surprised was I to see this about one year after I created it. I wish I had info on who ordered it so I could find out how they found it! 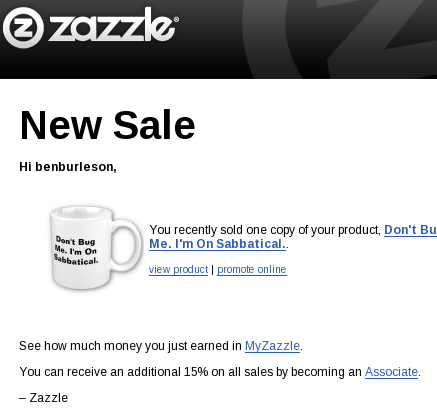 Notification of my first Zazzle sale! For those of you looking for a last-minute Christmas gift for that oh-so-hard-to-shop-for friend, look no further! This entry was posted in Uncategorized on December 16, 2008 by benburleson. The goal is a controller for various mechanical devices (move motors, read sensors via GPIO) with a web interface (HTML and web-services). I spent some time organizing a safe method for deploying application updates to a remote blackfin device. There were a couple restrictions that led to my final plan. If the update process fails, the device should still boot and be accessible via internet. Updating needs to be done remotely via internet. I originally placed the uImage parition directly after the u-boot partition, with the jffs2 partition at the end. The flash device on the CM-BF537E splits the flash into two halves addressable by toggling a GPIO pin (pf4). Some tools handled the addressing and toggling of pf4 for me, others didn’t. It turned out easier to move the jffs2 parition into the first half of flash and let the uImage parition straddle the flash halves. On the first boot, I wanted u-boot to download the uImage (via TFTP) and write it to flash memory. However, we did not want the device to always netboot, so u-boot would then alter itself to boot from the flashed uImage. U-boot also needs to erase the jffs2 paritions on a fresh CM-BF537E so the filesystem can mount. From here, the device is now running! Upgrades to the uImage stored in flash are possible, but the u-boot console is needed to halt the autoboot and run the tftpupdate macro again. This post is actually just the setup of U-Boot and uClinux to boot a blackfin device from a stored uImage (i.e. NOT netboot). Part 2 will explain the scheme for updating the device remotely – without netboot! This entry was posted in Programming on December 12, 2008 by benburleson. This was written by my friend Peter. It’s a powerful view of what California’s vote on Proposition 8 really means. This entry was posted in Politics on November 9, 2008 by benburleson.